Looking a Gift Horse in the Mouth? In this Centenary year, Canberra is honouring its oldest and newest residents with a commemorative medallion. Commemorative medallions have been used to mark significant events in Australia’s history on several occasions, such as the opening of Parliament House in 1988 and the introduction of decimal currency in 1966. 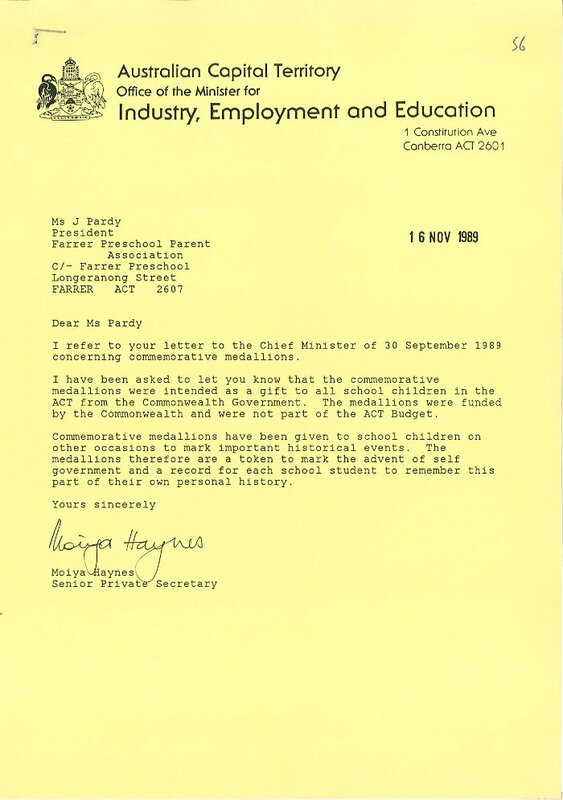 Another Canberra occasion considered medallion-worthy was the commencement of self-government in 1989. While today’s special keepsake is reserved for a select group—those born, or aged one hundred or more, on 12 March 2013—in 1989 all Canberra school children were entitled to the memento. 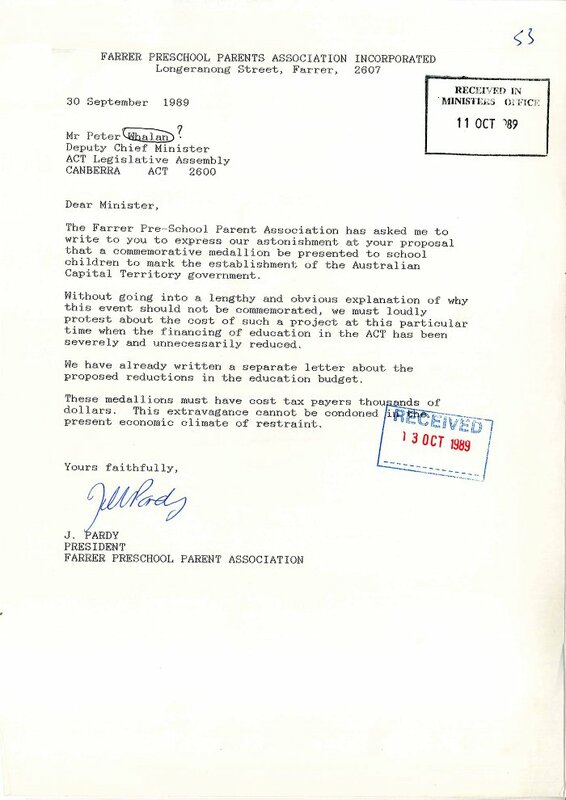 File ‘89/1966 – Australian Capital Territory Schools Authority – ACT Self Government Commemorative Activities – Schools’, documents the distribution of the medallions, and is ArchivesACT’s May Find of the Month. ArchivesACT has some of the medallions that may not have reached the children of Canberra. 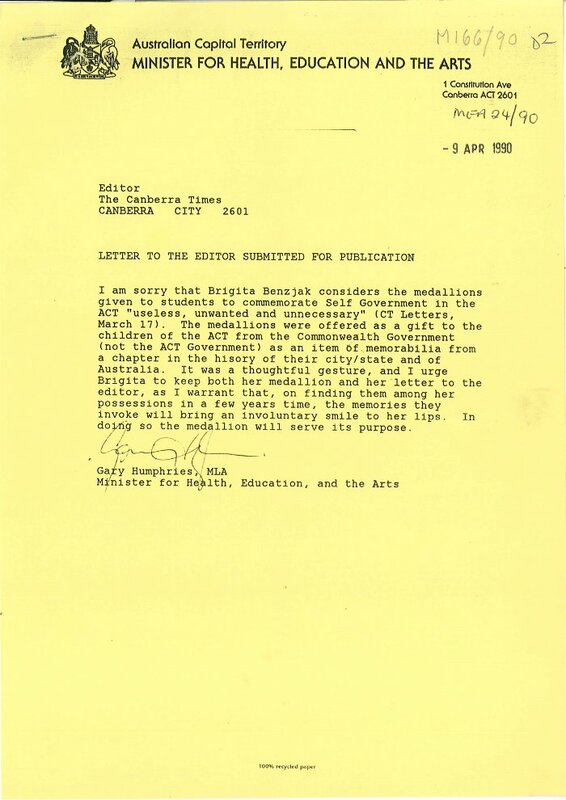 If you would like to receive your medallion—24 years late—visit ArchivesACT, upstairs at the Woden Library, between 10am and 3pm Monday to Friday.